A momentous event quietly occurred on Friday which could well have significant ramifications for the business practice that calls itself "outsourcing". Accenture dropped the term from its strategy line, "Consulting, Technology, Outsourcing", which it had been using for more than a decade, changing it to "Strategy, Digital, Technology, Operations". In addition - and perhaps more significantly - it renamed its BPO growth platform "Accenture Operations". The BPO term is still used when you drill right down to the specific business service lines, but Accenture wants to emphasize to its clients that it provides end-to-end services that go beyond just BPO. As many of us universally lamented last weekend, the outsourcing (so-called) industry has long been struggling to create a clear, meaningful identity and establish recognized career paths for almost two decades, and much of this is because so many of the service providers, advisors and enterprise customers have failed to create a positive brand perception - and communicate effectively - the value of partnering with service providers to improve and extend operational capability and productivity. Well - there you have it - most have actively distanced themselves from the term, with only Capgemini, Dell, Infosys, Wipro and Sutherland still wed to it. Oh - and for some inexplicable reason, the major HR services firms like ADP still use it, even though the HR profession looks more negatively at outsourcing than any other. In my view, "outsourcing" really describes the initial act when an enterprise moves the responsibility for processes and operations over to an external party. Once that act is complete, those processes being executed form part of an externalized service or operation for the customer. "Operation" signifies more than merely a service, but the orchestration of an end-to-end suite of processes, so I give Accenture credit for the being the first provider brave enough to use the "operation" term. Now we can sit back and observe many of the above providers also slip that word onto their websites and marketing copy. However, whatever these providers name their offerings, the real litmus test is going to be whether the buyers of services will start approaching service partnering as a genuine opportunity to improve their capabilities. Ultimately, they are the ones who would need to drop the O word and view services as what they are: services. Accenture's move is the most significant yet in terms of rebranding the outsourcing business - my best guess is that O will be pretty much gone from our business vernacular within a year. In this day and age when the inhouse organizations like technology, infrastructure, sourcing are becoming irrelevant, it is only appropriate that providers not only rebrand, but seriously start to challenge the status quo on how services were sourced. Yes another excellent blog - some brilliant insights coming from you and your colleagues recently. Phil, I was pleased to see your message about this evolution of the marketplace. If the media and industry analysts restrict their reporting to the activities of the v1.0 outsourcers then this is news, but for high value-add services such as legal, we've been eschewing the words "outsourcing" and even "operations" for a decade. We provide practical ways to improve efficiency, quality and outcomes through consulting, managed services and technology solutions. An industry at war with itself - how long will this unstable state of being last. While I don't wish to turn this into a branding second-guessing thread...it seems the mighty ACN may have further confused the issue (and themselves) by overcomplicating and overlapping terms and concepts as if to focus more on placating internal power structures than solving client needs. Here's my strategy, digital, technology, operations...branding advice: a) take a step back, b) calibrate messaging and service line definition around actual client business needs that usually transcend artificial service line distinctions, think competitive positioning, cost containment, or market/global expansion and efficiencies, and c) simplify terminology (Business Optimization) in marketing while creating a more efficient internal BD and engagement routing system to better serve clients and...allow for more organic engagement revenue expansion. Naive? Probably, but if any firm can do it, ACN can and in the process redefine the marketplace to its unique advantage. @GlobalMiles: I would counter with the fact that the "industry" has been unstable for a long, long time for many of the reasons highlighted here Outsourcing is an extension of service capability and resource that all operations managers should learn how to manage effectively to further their career potential. The focus needs to shift to how operations pros can do better analytics, GL reconciliations, app development, payroll processing etc. and become stronger partner managers to access the resources they need to be more effective. BPO really means the "lift and shift" component of outsourcing - i.e. when companies are figuring out how to do the initial deal and get started. However - and this is where things may get a little confusing - half of today's BPO deals are still in "lift and shift" mode (see here) and there are still a ton of clients yet to do a BPO, so my only reservation here is whether ACN is too far ahead of the curve here. But better to be ahead of the curve than behind it, right? Just like Saas is just a delivery model for software, "outsourcing" was just a delivery model for getting work done and it got a bad rap because it was literally replacing FTE with people largely offshore. I am not sure if "operations" is the right term today and I question even "process" services given so many areas are becoming non-linear and companies need to be responsive and agile. The best tagline for almost any managed business service provider today would be Strategy, Technology, Results. @Christa - it all really depends on what the companies providing or receiving the services want to call it to help them achieve better results. Clearly "outsourcing" is problematic for most buyers and many providers are genuinely providing their clients with a lot more than some offshore labor, and want to call it something that reflects this fact. I recently completed a post graduate diploma in Strategic Global Outsourcing, so that was money down the drain! In reality, the course did provide an opportunity to explore the tag 'outsourcing' and it is true to say, it doesn't reflect the value supplier partnerships bring to the best vendor/supplier relationships. The issue for outsourcing in contact centres for example is how our particular branch of activity has evolved to embrace a whole host of extended business services including analytics that help organisations to better understand and thereby better serve their customers. Simply labelling this an 'outsourced' service is denigrating the often significant value this brings to client customer experience management programmes. I would miss it if it were no more, like Spangles, and don't know what we could compare in-sourcing and co-sourcing to if it was no longer in use! Well, this is a interesting move. 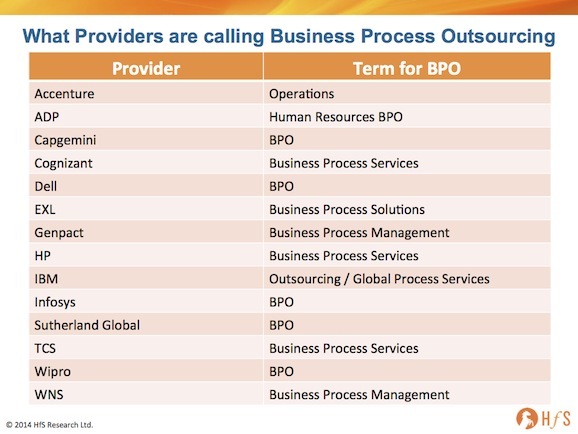 Nevertheless, Accenture calls its different offerings still BPO (check out this: http://www.accenture.com/us-en/outsourcing/business-process-outsourcing/finance-accounting-bpo/Pages/index.aspx). Now, why is that? My guess is "google". BPO as a search word generates simply more hits than Business Process Services, or Business Process Management or Business Process Anything ... It comes back to the old conflict standardization vs. differentiation. All vendors want to differentiate, so they are all using different terms for the same thing. This way, no term will become strong enough ... therefore I disagree with your assessment, Phil: I am afraid that BPO is here to stay. @Andreas - I don't think BPO is dead, by any means. However, the general term "outsourcing" is getting a little tired. I will blog on this shortly, but thank for your comment - and I do agree on the search hits! Outsourcing been very very good to me….. (sayonara and apologies to Garrett Morris . We have de-emphasized outsourcing, not just from a terminology standpoint, but from a focus standpoint in our consulting work. We see outsourcing as just one in a large kit of business transformation tools/approaches. 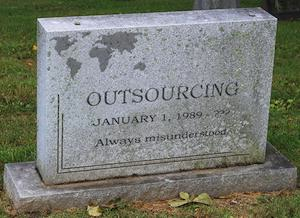 But having said that, "outsourcing been very very good to me…. " . Apologies to Garrett Morris.